We New Yorkers take our bagels very seriously. Every Sunday morning when I was growing up, my parents would go out early and pick up an assortment of fresh bagels, as well as accoutrements, such as various flavors of fresh cream cheeses, lox and whitefish salad (for my mom—the rest of us steered clear), sliced tomatoes and red onion. We'd listen to jazz and each take our favorite section of the newspaper and we'd feast. Every. Sunday. Morning. It was a wonderful ritual; that was back when I had a teenager's metabolism. As a fortysomething mom with thyroid disease, I feast on bagels much less frequently now. However, I still appreciate a good bagel—especially if it's an everything bagel! Everything is EVERYTHING. If you're unfamiliar with everything bagels, my friend, you have been missing out. These bad boys are positively saturated in the best of bagel toppings: sesame and poppy seeds, onion and garlic and salt. I recreated these flavor bombs in a homemade spice blend, with a very special secret ingredient that kicks it all up another notch. It's good on everything from baked potatoes to homemade pretzels to dips. And burgers. Yeah, it's really great in burgers. The only thing that could make it better? Everything Bagel-seasoned cheddar cheese. Yes, such a wondrous thing exists. I discovered it while on vacation. Not only did I snack on it every afternoon, I also brought some home (since it's apparently not sold within 20 miles of my house). You better believe that cheese went on this burger. So, imagine this savory flavor explosion: everything bagel + everything seasoned burger + everything cheddar cheese. Yeah, that's right, baby. Are you drooling yet? Gently combine beef and the everything spice blend, taking care not to overwork the mixture. Shape into patties. Grill (or cook in a skillet) to desired doneness, topping with cheese in the last few minutes of cooking. Assemble the burgers on the bagels with lettuce, tomatoes, and onions. Top the burger with an additional sprinkle of the everything spice mix. It's that quick. This would be a great weeknight dinner during the school year, when time for making a homemade supper is at a premium. These burgers are super kid-friendly—as burgers tend to be!—while offering interesting flavors to please adult palates. If you don't eat bread (or are just watching your carb intake), you can skip the bagel bun. 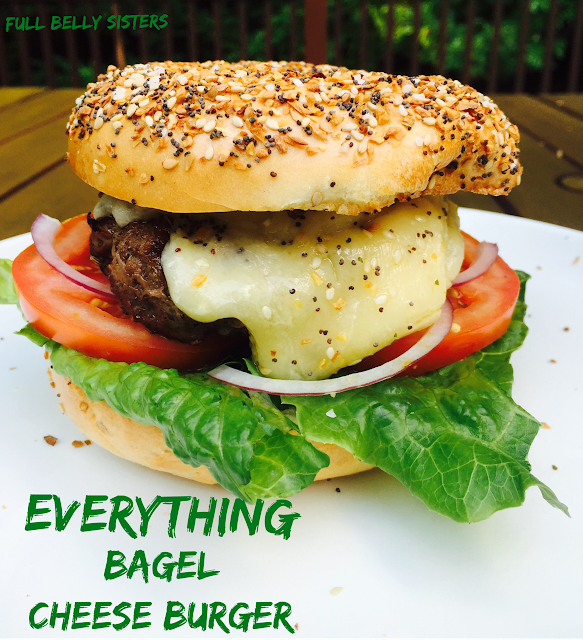 After all, you've got that delicious everything bagel flavor right in the burger! Do you love everything bagels as much as I do? Ooooh, this is the 'bomb'!!! My son in law will go crazy for this, it's to die for!!! As for the cheese, I have not yet seen it in my stores but I will keep a sharp eye out for it. Great post! It's definitely worth looking for, I am hooked on that cheese! It's funny. I wouldn't go near whitefish salad when I was a kid but now I love it. I still won't touch herring, though... Henry would love this burger! I'm going to send him the spice mix in my next care package! 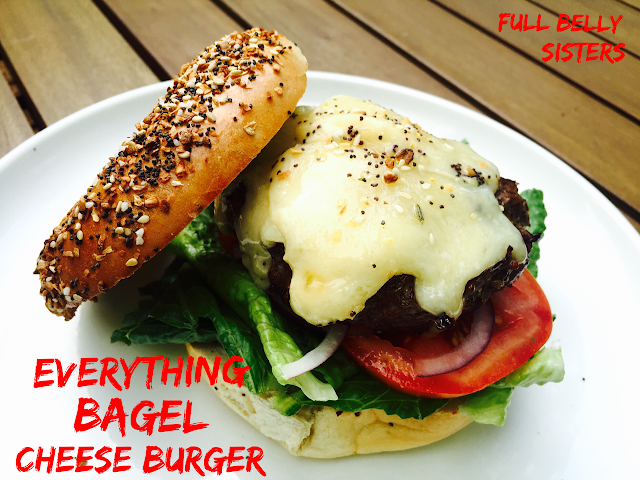 Ooooh your Everything Bagel Cheeseburger looks crazy good! Thanks for bringing back such sweet memories as being a Philly girl, Sunday morning breakfast was a major event...all kinds of bagels (especially egg....only a Philly tradition I know! )..lox, whitefish, kippered salmon, creamed herring with all the extras! And being my dad was in the wholesale foods business, we always had 5 pound loaves of sweet muenster and cream cheese at home. And of course the danish from our favorite bakery...which my dad said was needed to "kill the onion taste! LOL! Thanks for the great post and yummy cheeseburger! My kids love to use bagels instead of hamburger buns...I love this. Wow, that's quite the cheesy Everything masterpiece. Yep, drooling! This has my name all over it! Yum! Fun dish and great way to use the bagel! I love this burger! 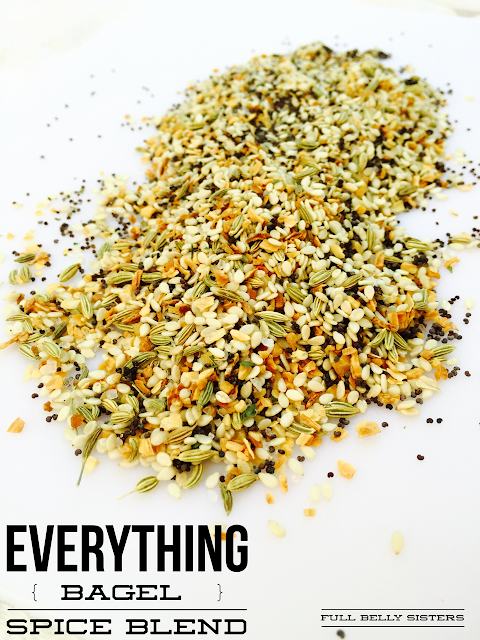 your homemade seasoning blend and the bagel buns are definitely encouraging me to make this soon! Thanks, i'm so happy to hear that! I am all over this Burger! I love the use of a mouthwatering bagel!! That melted cheese on top is all the money! Oh my, how I want to eat this right now - but we're having ratatouille for dinner! I could sink my teeth into these right now... sounds so good. Haha, wish I could give you a bite! Thanks, Nettie! Isn't that cheese SO GOOD? 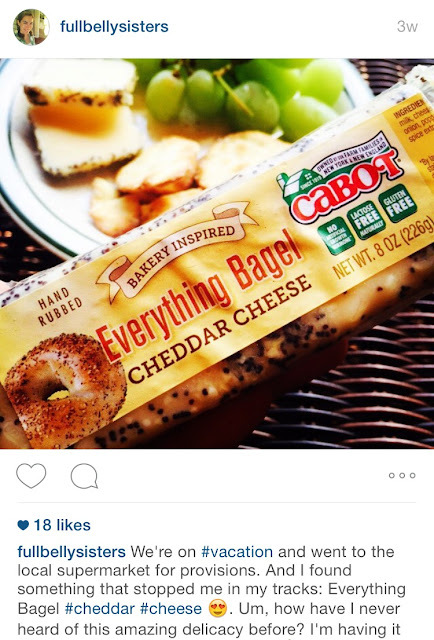 I'd never heard of everything bagel cheddar cheese, but I love Cabot and everything bagels! 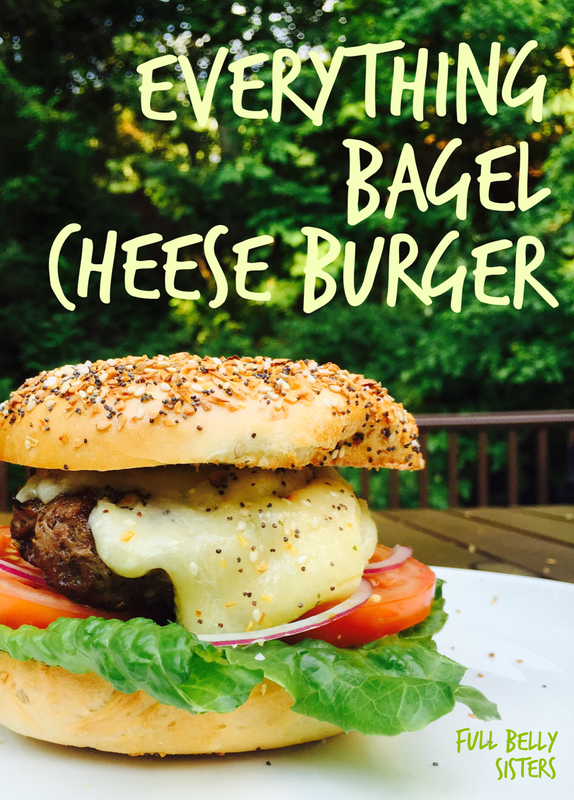 A burger in a bagel is genius! Why have I never thought of that before? Yum!